Before making any repairs to the deck, remove dirt and wood fibers with a pressure washer. When using one, be sure to keep the pressure stream moving. Otherwise, you could gouge the wood. Allow the deck to dry overnight. If you encounter a nail that has worked loose from a board, remove the nail with a cat's paw or a hammer. Use a screw that's longer than the nail to reattach the board. If you have a board that's split down the middle, mark the damaged board next to the leading edge of the first support joist that's completely past the split. Be sure not to mark an area that's directly over a joist or you could damage your saw when you begin cutting. Cut the board with a jigsaw, remove the nails or deck screws and remove the damaged wood. Use deck screws to attach a pressure-treated 2-by-4-inch support block to the joist. The support block will hold the replacement board in position. Cut a replacement board to size, pre-drill and fasten it to the support block and joists with deck screws. Your replacement board may appear to be higher and wider than the existing wood, but it should shrink as it loses moisture. If the board still appears to be higher than the surrounding boards after being in place for a few weeks, you can smooth it down with a belt sander. Be sure that all nail or screw heads are recessed into the wood before you begin sanding. Even though pressure-treated lumber resists insects and decay, it's still vulnerable to moisture and the sun's rays. To preserve it without changing the color, use s clear wood preservative that contains a UV protector, which will bring new life to the surface while protecting it from the elements. If you want to add color, use an exterior stain first. Exterior stains come in both solid and semi-transparent finishes. Always use the semi-transparent for the decking area, but try a solid color if you want to highlight railings or banisters; it ends up looking like a painted finish. Exterior stains are available in oil or latex, and both provide fade and mildew resistance. Wearing protective eyewear and gloves, apply preservative or stain with a roller or a brush. Let the product sit on the wood decking for about 20 minutes so that it has time to penetrate, and then go back over the surface with a brush to give the deck a more consistent finish (this also helps get rid of any puddles that will dry as shiny patches). Apply a second coat for good coverage and protection. Allow the deck to dry for 48 hours, and then apply a sealant. 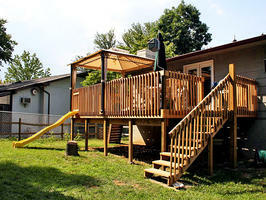 Exterior Specialties of PA is here to help with all of your deck maintenance, deck repair, deck building, deck installation and deck inspection needs. Call us today at 215-453-9180 for your FREE estimate.